It’s time to tune up the worn-out kitchen cabinets and give them your attention to make them look and work as good as new. You don’t have to be an expert handyman because there are easy ways to perform DIY cabinet repairs for common cabinet problems like squeaking doors, sticky drawers, misaligned hinges, and many more. Here’s how to do them. 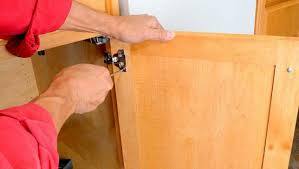 Use a screwdriver to tighten the door and mounting screws before adjusting them. You can also use a drill to turn the screws easily instead of a screwdriver. Check out this website for the best drill for this purpose. Align the depth and side screw as well. If you are lucky to have European-style hinges, you can easily adjust them by turning the screws. Although they may look complex, the hinges can be adjusted in either three or two directions. If they don’t budge at first, try the other direction. Close the cabinet door to check the fitting, adjusting them again until a perfect fit is obtained. If the door is not aligned with the adjacent door, turn the depth screw to adjust it. The depth screw is responsible for closing and opening the cabinet doors. Some depth screws affect the door when they are turned, but the typical ones can be loosened by just nudging the door in or out, then can be tightened already. If the hinges have no depth screws, simply turn the side screws. At times, the cabinet door does not stand parallel or is not in square proportion to the entire cabinet. This requires adjusting the side crew by loosening the depth screw. In case the door is flush and parallel with the adjacent doors but is in different height, use the mounting screws to adjust the plates. Simply loosen the screws at both sides, slide the door vertically, and then tighten the screws. One of the easiest DIY cabinet repairs involves works to be done on latches. A latch is a type of mechanical mechanism installed to serve as a fastener to join or hold two different objects or surfaces while still allowing them to separate. When the latches in a cabinet don’t catch, the next best thing to do is to tighten or adjust them. If they still don’t catch, they need to be replaced. New breeds of cabinets have self-closing hinges with either magnetic roller catches that conveniently close the doors shut. When the catch no longer holds the door closed, it can either mean the need for adjustment or replacement. Both of these tasks are easy to perform since they only require dealing with two screws fastened to the catches. Readjust the catch several times until it becomes tight enough. If the doors are not flat against the cabinet, add a magnetic catch at the trouble spot. The magnet can keep the door tightly shut in place. If the drawer slides are already deformed or the rollers have rusted already, it’s time to replace them with a new set of drawer slides. To remove the worn-out slides, loosen the screws to remove them completely. Make sure to buy the same specifications so that screwing can be made on the same spots. A few drizzle of lubricant is enough to make the hinges loosen a bit and enable the drawers to slide smoothly. Remove the drawers first by pulling them out. Wipe the tracks with a clean cloth to remove dirt or rust. Coat the tracks and rollers with a spray of the lubricant. Restore the drawer into position and try gliding it in and out repeatedly to see if they spin easily. DIY cabinet repairs only need some of the most basic tools to accomplish them. Doing you’re your repairs does not only save you money, but it also makes you adept iin-houserepairs rivaling the neighborhood expert handyman.